Note: For the full Clockwork City experience, you may want to pick up the prologue quest from any Mages' Guild and will send you on a mission to stop prominent Mages' Guild Scryers from being killed by their own shadows. Upon completion of the quest, you’ll receive the Clockwork Obscuros memento that produces a dazzling projection sphere of the Clockwork City. There are four daily quest NPCs in Clockwork City. 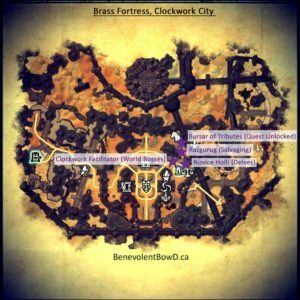 They are located a short distance from the Brass Fortress Wayshrine (see map below). Tip: the delve quests can be solo'ed. 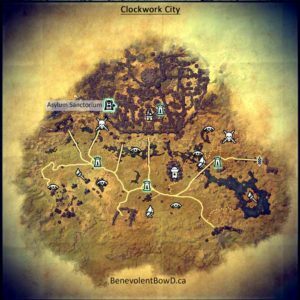 Novice Holli offers quests that require adventuring in the Clockwork City Delves once you complete the delve quests offered at their entrances or within. Oiling the Fans: The Clockwork Apostles have tasked me to continue maintenance in the Hall of Regulation. I need to grease a ventilation fan using oil found within the repair factotums. Tip: Oils drop off Factotum Conduits, Factotum Expurgators. A Shadow Malfunction: The Clockwork Apostles sent a member of the Mages Guild through the portal to explore the Shadow Cleft. He hasn’t returned. Tip: Find Evoker Favar is in the watery passage east of the skyshard. A Shadow Misplaced: The Clockwork Apostles sentexplorers into the Shadow Cleft to find out more about the mysterious realm and the reason it’s connected to Clockwork City. Tip: Find Novice Oscard in the ruin a short distance east of the named boss. Again Into the Shadows: The Clockwork Apostles sent a member of the Mages Guild through the portal to explore the Shadow Cleft. She hasn’t returned. Tip: Find Evoker Tadari in the ruin northeast area of the delve, northwest of the skyshard. Tip: A group of 4 players, is recommended for the World Boss quests. The Clockwork Facilitator will offer you a daily quest to kill an Elite World Boss. A Fine-Feathered Foe: Defeat the creature Wraith-of-Crows and other Daedric incursions in the Clockwork City’s Radius. Inciting The Imperfect: Defeat Sotha Sil’s creation, the Imperfect, in order to test its capabilities. I’ve also been asked to gather its lost sequence plaques. Tip: Plaques are found on the boss's corpse, around the room, on the entrance bridge, and below the entrance bridge. Raxgurug offers quests that require the harvesting nodes and visiting various points of interest in Clockwork City. Note: When you accept these quests, the corresponding node types around the zone will be flagged with quest markers. A Bitter Pill: Harvest sources of alchemy plants in Clockwork City and collect specious syrup in the Everwound Wellspring. Tip: Plants are found within Alchemist Satchels (nodes) and Everwound Wellspring is found in the eastern part of Clockwork City. The Specious syrups are located in oversized chests (caches). A Daily Grind: Collect Flash Stone from Sources of Ore and Metal Pellets. A Sticky Solution: Collect Fabricated Husk from Wood Sources and Counterfeit Coal. Tip: Husks are found on scraps of wood (nodes). The counterfeit coal is found in chests in the reactor (western) district of Clockwork City. Tip: Runic Residue found on Enchanting nodes. Fuel for our Fires: I should harvest sources of water and see if I can find synthetic oils. I also need to collect skimmer mesh in the Halls of Regulation. Tip: Synthetic oil  found on Solvent (potable water) nodes. Loose Strands: Collect Metalllic Fibers from Cloth Sources and Artifical Lodestone Parts in Mnemonic Planisphere. Tip: Cloth Sources are called Torn Cloth in Clockwork City. Lodestone are found in rubble piles Planisphere in the upper area near the named mobs. These quests are unlocked when you obtain the Birds of a Feather achievement by completing the “Lost in the Gloam” quest (the third quest of the Clockwork City main quest line). Novice Holli offers quests that require adventuring in the Clockwork City Delves. A Matter of Leisure: Gather Toys and Games (5) from people who insulted the Blackfeather Court. Tip: Items can be pickpocketed anywhere, but have to be flagged as stolen to qualify for quest. A Matter of Respect: Steal utensils, drinkware, dishes, and cookware (5) from people who insulted the Blackfeather Court. A Matter of Tributes: Steal cosmetics and grooming supplies (6) from people who insulted the Blackfeather Court. Glitter and Gleam: Acquire 3 pieces of ornate armor from Clockwork City and beyond to add to the Blackfeather Court’s collection of glittering and gleaming objects. Tip: You can get ornate items from delves, dungeons, or other daily quest rewards (e.g. crafting writs, mages' guild). Jewelry are not considered armor for this quest. Morsels and Pecks: Scavenge elemental essence, supple roots, and ectoplasm to help feed the Blackfeather Court. Tip: These items do not have be found in Clockwork City. Save some of these items from your other adventures. Elemental essences drop of elementals (fire, frost). Ectoplasm often found on ghost like creatures and the wafts in the Clockwork City delves. Supple roots can be found on Spriggan's and Lurchers. Tip: There are a lot of elementals in Reapers March. Tip: There are a lot of spriggans and lurchers in Glenumbra near Wyrd Tree Wayshrine. Also, a lot of hides that can be harvested near Deleyn's Mill wayshrine. Tip: These items do not have be found in Clockwork City. Save some of these items from your other adventures. Carapaces drop of beetle-like creatures or mudcrabs. Creatures with hides (e.g. imps, wolves, etc.) have decent drop rates for hides. Any daedra has a good chance to drop Daedra Husks. The weekly quests are on a seven day timer and don’t reset at a recurring time each week. There are all-new skill augmenting “Asylum” weapons (which you can read more about below) in the same fashion as Master and Maelstrom weapons. In Asylum Sanctorium, you can obtain rewards based on not only the Trial’s difficulty (Normal or Veteran), but also on how many allies the boss, St. Olms, has with him. Defeating either St. Llothis or St. Felms on their lonesome will award you with a green-quality (Normal mode) or blue-quality (Veteran mode) armor item from one of the item sets in Clockwork City: Mad Tinkerer, Unfathomable Darkness, or Livewire. However, doing this means they cannot aid St. Olms in his fight against you, which lessens both the rewards, and the difficulty, of fighting him. If you defeat St. Olms with both of his allies in the same battle, on Veteran mode – the hardest possible configuration of the Trial! – you will receive a Purple-quality Perfect Asylum weapon, more powerful than the imperfect Asylum weapons awarded in other configurations. You will also receive two Purple-quality pieces of Clockwork City set armor, and a Gold-quality Jewelry piece from those same sets. In addition, you will rarely receive a Runebox for the Clockwork Reliquary Polymorph.